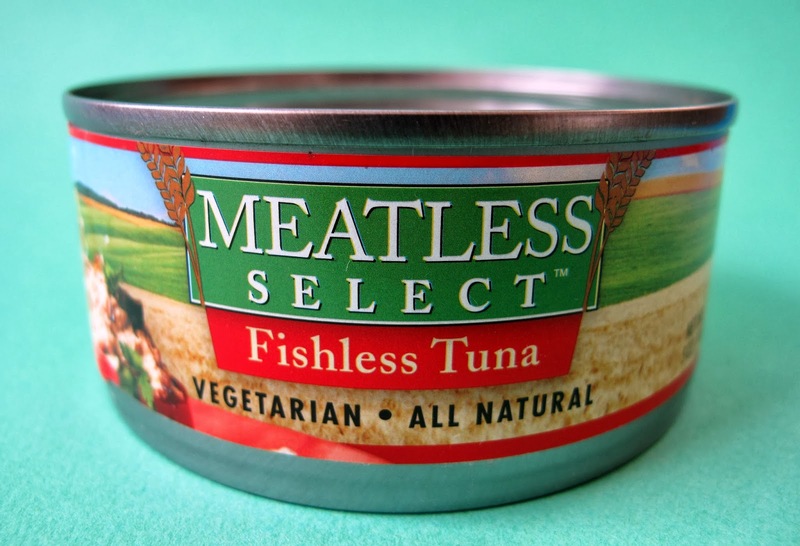 I've had this Meatless Select Fishless Tuna from Atlantic Natural Foods on my radar for awhile now, but I was having trouble finding it. I ended up getting a can from Vegan Essentials, but it looks like it is also available from other online and brick & mortar retailers. Tuna was one of the last things I gave up before going Vegetarian and it was one of my favorite meals, totally easy to make and super convenient. So I'm pretty much destined to try faux tuna! Opening and draining the can definitely brought back memories. It even had a bit of that fishy smell that would cause your cats to go nuts. I drained the liquid out of the can and then mixed the tuna in a bowl with some Vegenaise. Then I lightly toasted some bread, cut some lettuce and put it all together. So, let's start with the good. Texture-wise, I thought it was similar to real tuna. Perhaps not as dense, but close enough for me. Taste-wise, I thought it was lacking in the tuna tasting department. It needed some brininess, or something to tart it up a bit. Some spices or oil might have helped, but right out of the can it just wasn't the best. I still think it's worth trying, just have your expectations in check. Tofutti contacted me about trying their new Classic Original Pizza Pizzaz and of course, I'm not one to refuse Vegan pizza. I've actually had Tofutti Pizza before. I enjoyed it, but it's not available at very many stores around Omaha and so I rarely eat it. 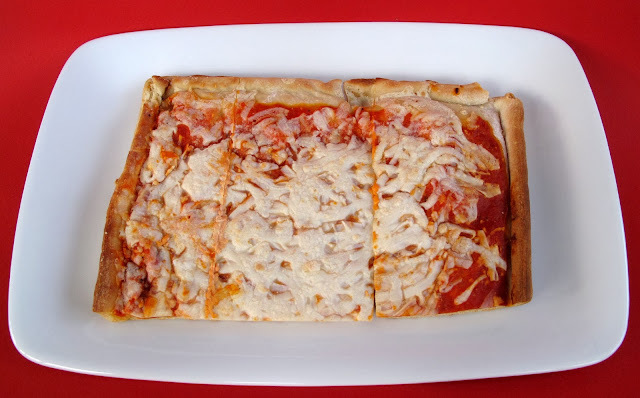 I always found Tofutti Pizza to be the perfect size for a toaster oven and your tiny college dorm. 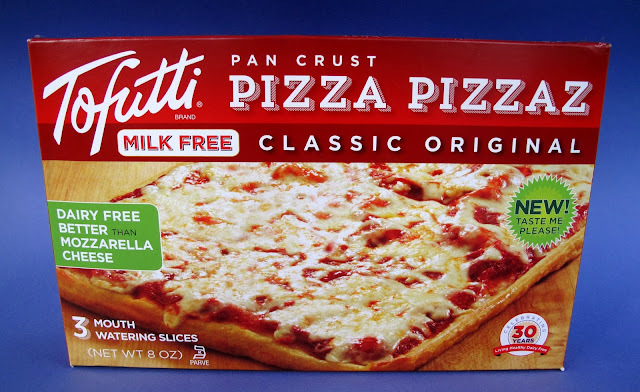 So it's been a while, how does the "new" Tofutti Pizza hold up? I'm really confused by the "new" part because it tastes like the same pizza to me. That's not a bad thing, just confusing. Maybe the ingredients changed a bit? If I wasn't so lazy I would go look, but meh. It's basically sweet saucy pizza with cheese... pretty perfect. Some have compared it to cafeteria pizza or cheap 80's pizza. I would have to agree, and again, that's not a bad thing as long as that's what you know you are getting. No-frills Vegan pizza. Also, it's not a pretty pizza. Oddly cut and shaped, I do find it interesting. The packaging reveals some new varieties, which hopefully, I'll be able to try soon. In closing, if you want some down to earth O.G. Vegan pizza that isn't too big or small, Toffuti Classic Original Pizza Pizzaz is it. If you can find the Classic Original, try it! I think you'll be glad you did. 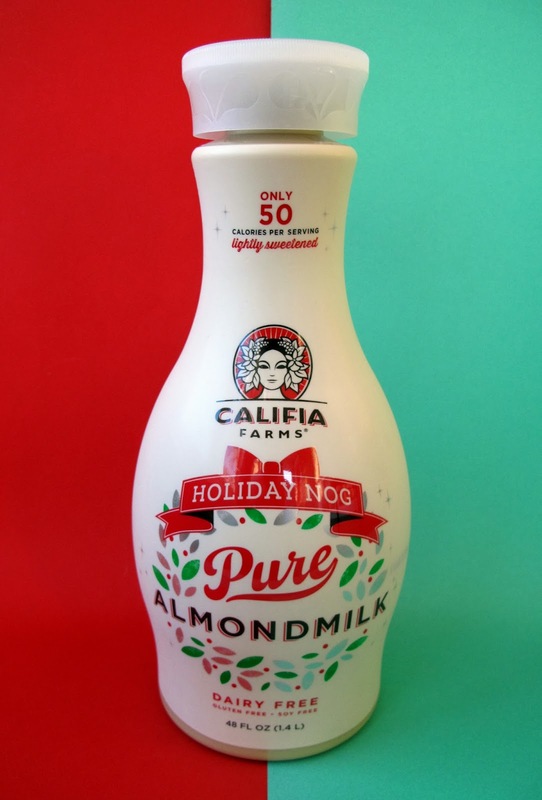 New this year is Califia Farms Almond Milk Holiday Nog. I'm always up for new attempts at dairy-free nog! Most of the other Vegan nogs are soy or coconut based, so I appreciate Califia Farms for creating an almond milk one. So let's have a sip and get in the holiday spirit! My first thought is that the nog is a bit thinner than others. That can be a good or bad thing, depending on your nog preference. I happen to like my nog on the thicker side. When it comes to the flavor though, I was more impressed. Strong notes of nutmeg definitely sell this as a holiday nog. 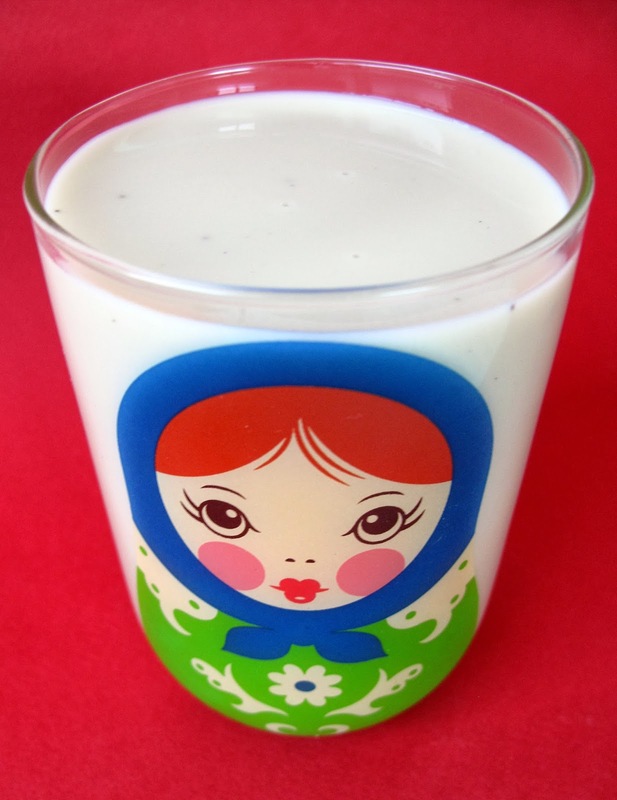 I thought it was more like a nog-flavored almond milk, and that made it delicious in its own right. It's more of an every day drink than a decadent treat, so you can take a few refreshing swigs anytime and it won't ruin your appetite. So while Califia Farms Almond Milk Holiday Nog may not be my first choice for the holiday table when I want something very thick and creamy, it's definitely a drink I'll keep stocked this season, for every day use.